If you consider installing Solar Panels on your, or your client's, roof then this is the tool for you. It will help you check whether this is feasible by calculating required ballast weight / fixings forces / roof loads from wind acting on Solar Panels (also called: solar modules, photovoltaic modules, photovoltaic panels or PV modules). The design is in accordance with SEAOC PV2 (Wind design for low-profile solar photovoltaic arrays on flat roofs by Structural Engineers Association of California) and with ASCE 7-10 (for solar photovoltaic arrays on pitched roofs like gable and hipped roof). The spreadsheet is in imperial units. This spreadsheet is extremely easy to follow, and no engineering knowledge is required to use it. This is achieved by maximising automatic calculations (edge factors and pressure coefficients are automatically calculated based on diagrams in standards). There are "live" diagrams with dimensions for easy verification of input. Therefore even a regular house owner will be able to use this spreadsheet to calculate the required ballast weight or fixing forces. This type of modules does not require any fixings into existing roof structure and hence there is no need to penetrate existing roof membrane. Making this a very convenient and easy way of post-installing Photovoltaic arrays. The spreadsheet calculates ballast weight required to prevent uplift and sliding as per SEAOC PV2 guidelines. Pitched roofs are very common in US. To use these for supporting PV modules it is necessary to fix directly to loadbearing elements within the roof structure. In such a case it is essential to calculate fixing forces holding a PV module and hence loads on a supporting roof. These calculations are covered by this spreadsheet. If you have a flat roof but it is not man enough to support ballast weight then you should explore this type of PV modules. The spreadsheets assumes there are four fixings points per panel i.e. one fixing point in each corner of PV panel. - Design is based on SEAOC PV2 (2012) and ASCE 7-10 (2010). 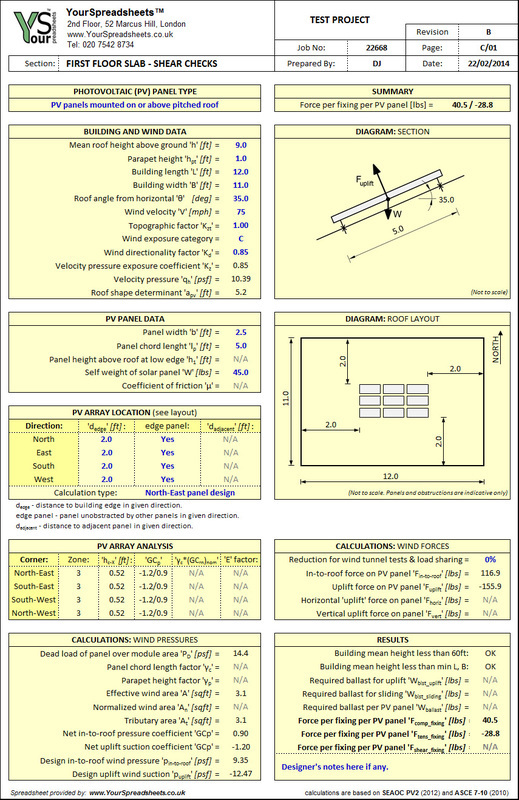 FREE Lite version: Wind Load on Solar Panels Design Spreadsheet to SEAOC PV2 and ASCE 7-10 (1.0). The restriction in this free lite version is that you can not change the company name nor the logo (shown in top left corner) - currently set to a made up company. Also you cannot change angle, area and weight of PV module. 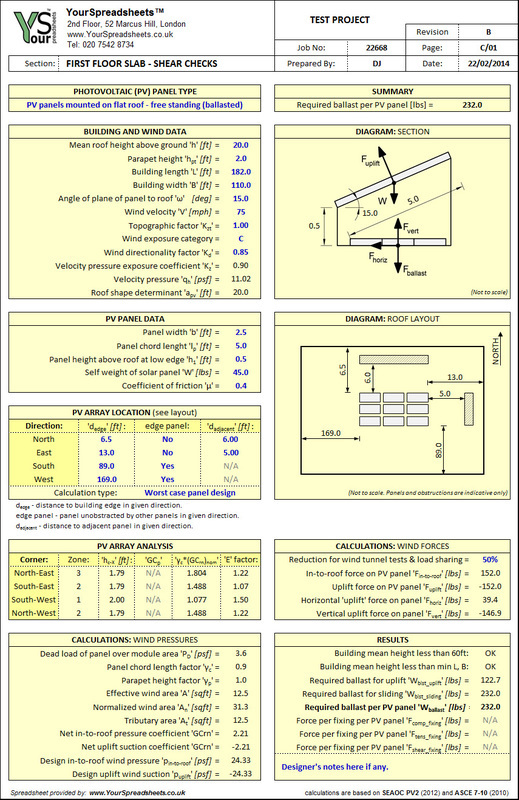 FULL version: Wind Load on Solar Panels Design Spreadsheet to SEAOC PV2 and ASCE 7-10 (1.0). Fully working version where you change the company information and logo in the top left corner. You can also change angle, area and weight of PV module.